On Saturday afternoon (my first free Saturday afternoon since the beginning of November) I sat down on the floor with the typewriter and the cat and hammered out my 2014 dreams…I say dreams because I’m the worst at resolutions. The. Worst. But a fresh new year is not a fresh new year for nothing…so why not resolve to do better? *return mail within 1 week: I fell off the mail wagon at the end of last year…I’d like to be better about responding more quickly and a week is doable without taking the fun out of it for me. I’m also planning to participate in Letter Month again this year. *Hasegawa Happy Hour: Inspired by this post on Gina Sekelsky’s blog, I decided that Thursday nights–the only weeknight Naoto and I are home together–would begin with a happy hour. I”m not going to kill myself creating a new cocktail and snack every week, but I’d like to use the Hasegawa Happy Hour to try new snack recipes, to try new cocktail recipes and to connect with my husband (and our friends…because some weeks will have to include special guests.) And, because I’m still coaster happy, I’m dreaming of some special Hasegawa Happy Hour coasters. *schedule & routine: I am the worst about keeping a routine. I haven’t had a real routine since high school because my college schedule was a crazy mix of school, work and residence life stuff, my old job had a really varied schedule and now no two weeks are alike. But I need some discipline regarding going to the gym, cooking better meals for myself and for Naoto and getting the cleaning done. *plant another garden: Why not? *make bread: My dad gave me a bread recipe a long, long time ago…it’s time to pull it out and try my hand at bread making. I think it’s going to be another Homemaker’s Challenge. *host 3 dinner parties: Just because. *more Chicago adventures: We tried to go to Eataly with our friends a few weeks ago. Eataly was a disaster but we had such a great time eating at Xoco and bar hopping. It reminded me that we need to explore more of our own backyard. *take 3 vacations: We are planning another trip to Japan (sooner than later) and I’m heading to Ex Postal Facto in February. I really want our third vacation to be a road trip to DC (to see the National Postal Museum)…I’m still negotiating with Naoto. *create a zine: This has been on my list for too many years. The idea is there, the time is there…no excuses. *PLAY not perfection: I get too wrapped up in doing things well the first time. When I went to the printmaking class at the library last year, I threw it all out the window. I didn’t care if other people had more amazing carvings than I did. I didn’t care if my block was perfect. I didn’t care if I caught on right away. And I had so much fun. I want to remember that feeling this year as I try new things and experiment with old things. Are you a resolution maker? Any big dreams for 2014? I admire your plans for the year and am looking forward to see your zine, hoping you will share some of the making process too. I haven’t made plans, but I did select a word for the year : balance. That word alone will keep me fairly busy I expect, still much to achieve there. Please do! I need all the help I can get since I’m an annual resolution failure! 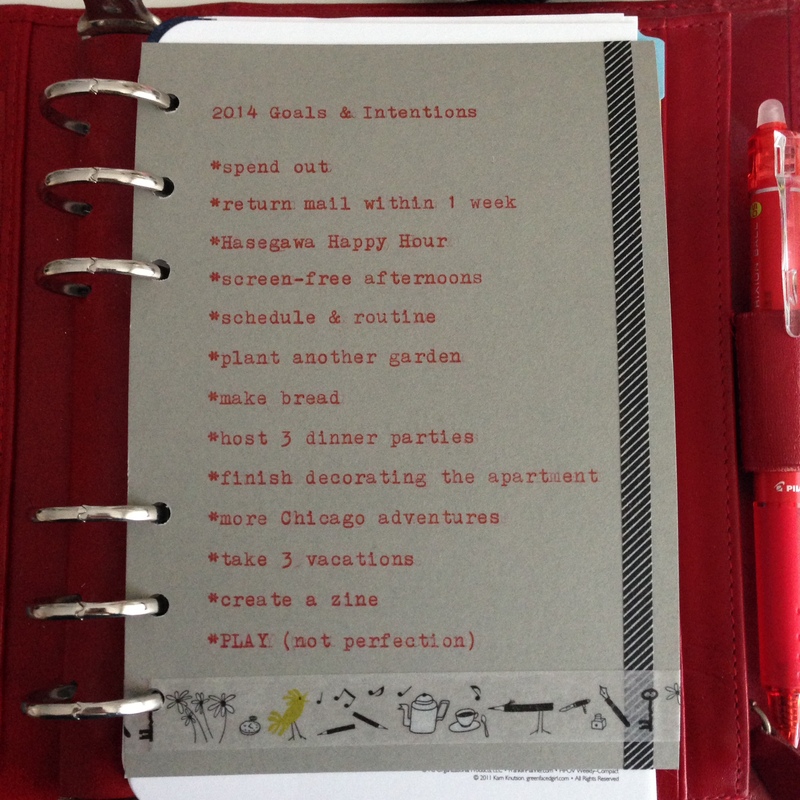 I made a goal list for 2014 but reading yours makes me want to update it and add some things! Baking bread is something I’ve also always wanted to do but has really intimidated me for some reason. Let’s live tweet synchronized bread making. Sounds like a plan! I’m hoping to try it out tomorrow, but I have to get out of bed early enough to make it happen without chickening out! ROAD TRIP, ROAD TRIP, ROAD TRIP.